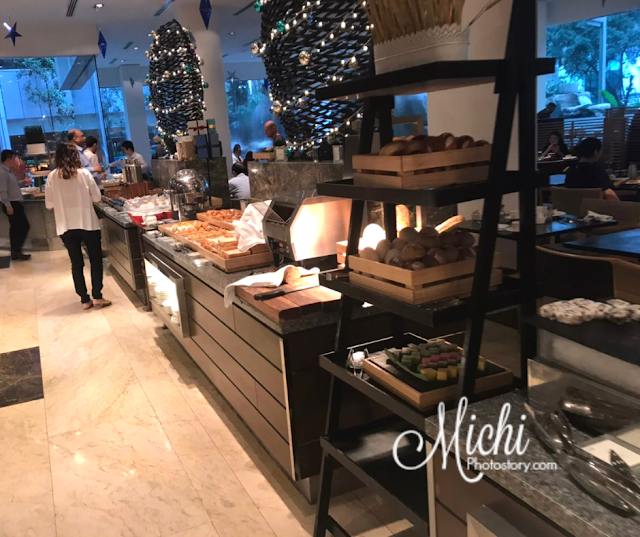 One of our Christmas traditions is attending church service in Tagaytay every December 25 and after mass, we will eat breakfast. 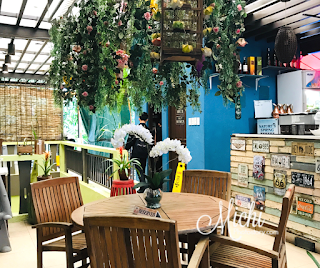 For the last few years, we ate at Breakfast at Antonio’s, Cafe Veranda at Taal Vista Hotel and Restaurant Verbena at Discovery Country Suites. If you remember my post last year, we were supposed to eat a restaurant near Crosswinds but we ended up with Restaurant Verbena. But this year, we pushed our plans and off went to Cafe Voi la. 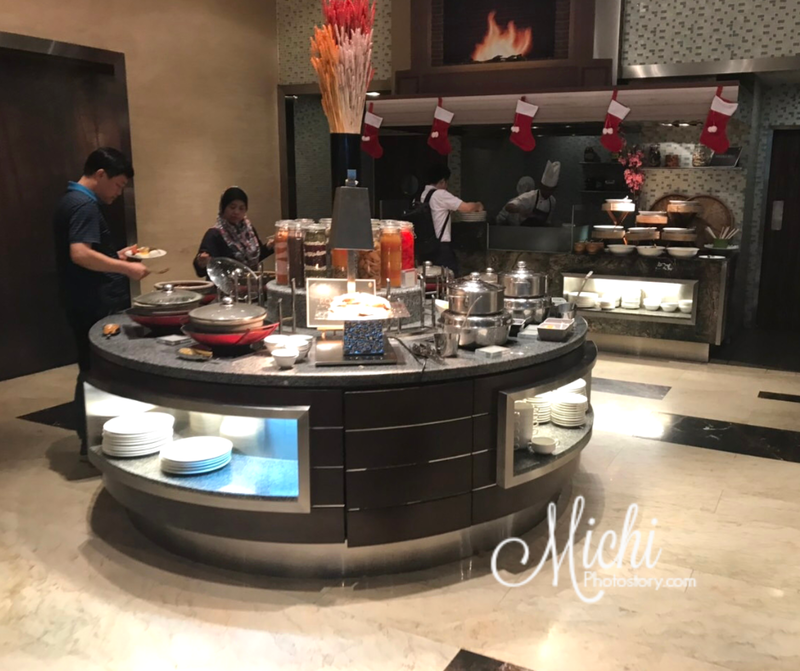 It is a good decision too kasi puno parking ng Discovery Country Suites, mukhang marami na nakadiscover so marami na nagbreakfast din. Hehehe! 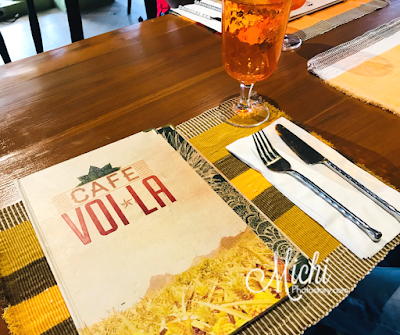 My husband ate at Cafe Voi La during their company team building and he said masarap daw ang food. We arrived around 8:30AM and there were only two occupied tables but some tables were reserved. 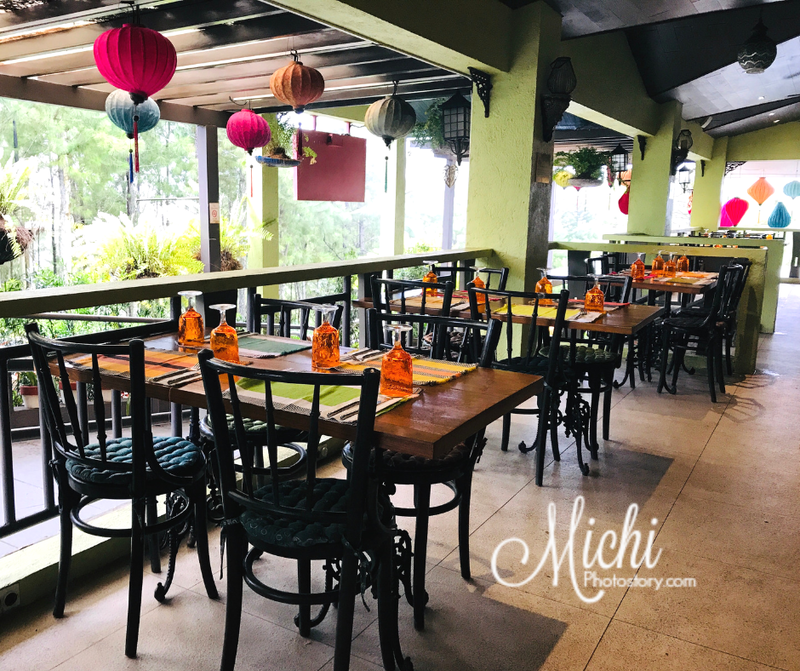 So we were seated outside the restaurant which is not a problem since malamig naman sa Tagaytay. 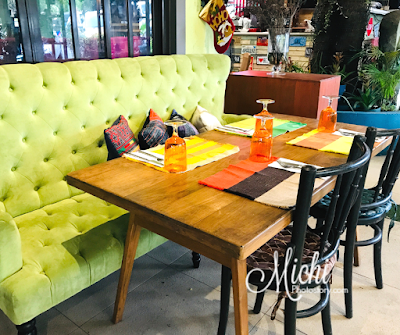 The restaurant interiors are quite unique and vintage, parang every corner is intagrammable. The waitstaff gave us the menu and advised na breakfast meals lang daw available so hindi na kami nahirapan magbrowse ng menu. They offer rice meals, pancake, omelet, and American breakfast. For breakfast, I find the price expensive, the range is P295-P395 for rice meals and drinks are not included yet. We ordered Eggs Benedict P395, Garlic Longganisa P295, Garlic Beef Tapa P375, and Cafe Americano P125. 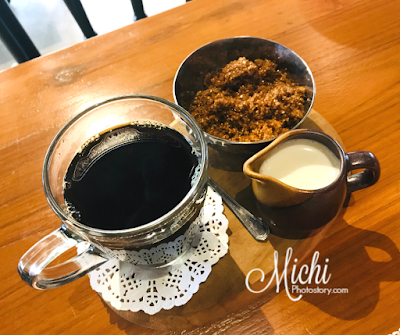 They served the coffee, longganisa and beef tapa first. 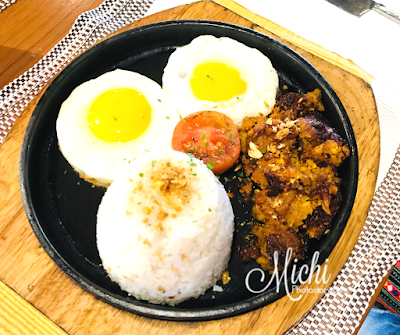 My son ordered Garlic Longganisa, the meal includes homemade longganisa, jasmine rice, and two eggs. The serving is too big for a kid. The longganisa is just okay, masarap sana but it is too salty for our taste. 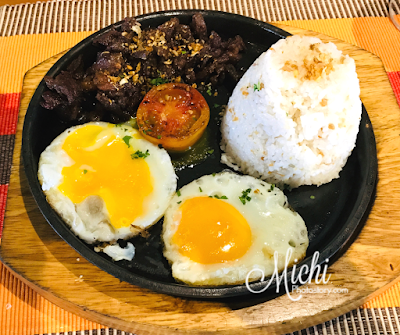 When we asked what is the best seller, the staff said Garlic Beef Tapa and now we knew why it is the best seller. The homemade sirloin tapa is tender and yummy. It comes with jasmine rice and two eggs too. 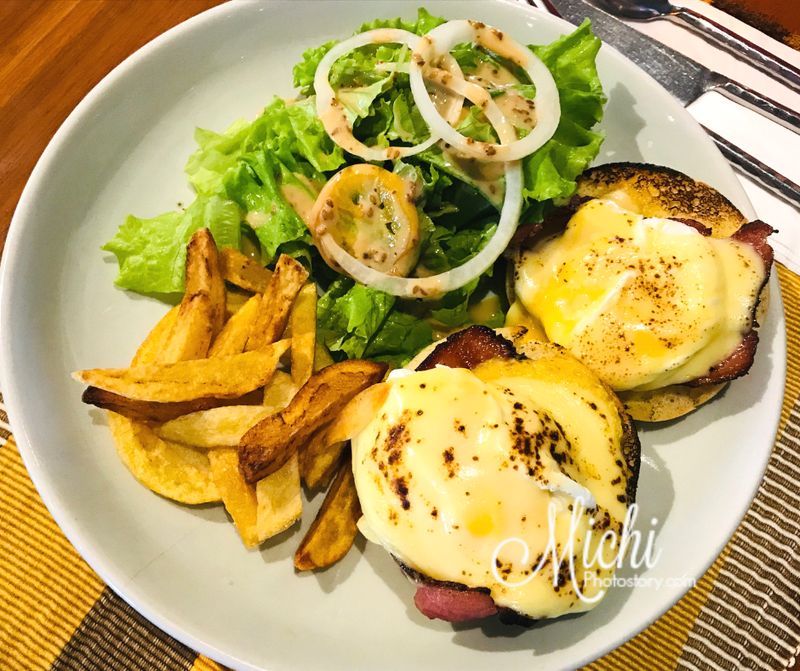 I ordered Eggs Benedict and I was surprised when I saw fresh salad and fries because it was not stated in their menu. I was expecting poached eggs and ham with hollandaise sauce and cheese lang. Kakatikim ko sa garlic longganisa and garlic beef tapa, nabusog na ko so I was not able to finish my order so take-out. My son likes the Egg Benedict too. While eating our breakfast, one celebrity and one politician came to eat breakfast too. So it seems that it is popular sa may budget. Hehehe! The food and service are good but the price is not budget friendly. 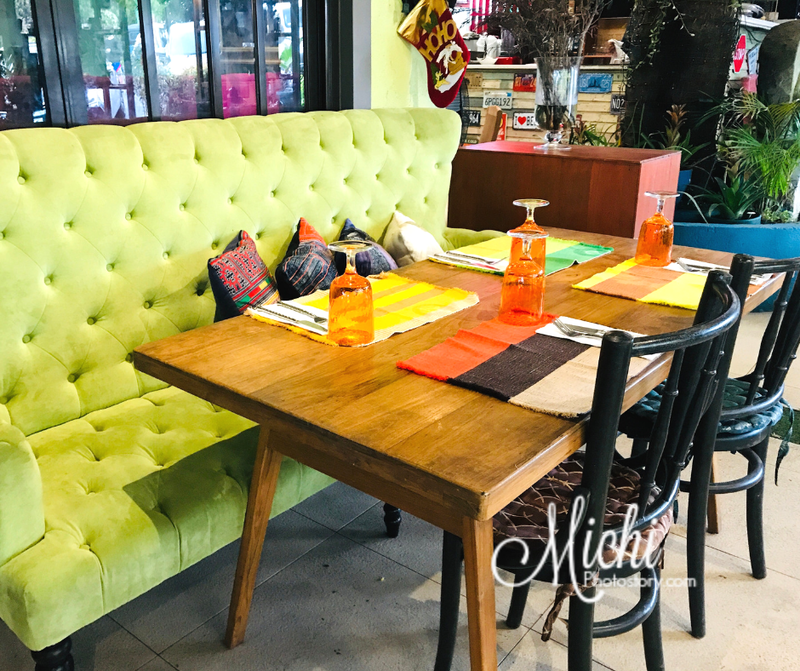 If you are going to eat here, expect to pay P500+ per person. 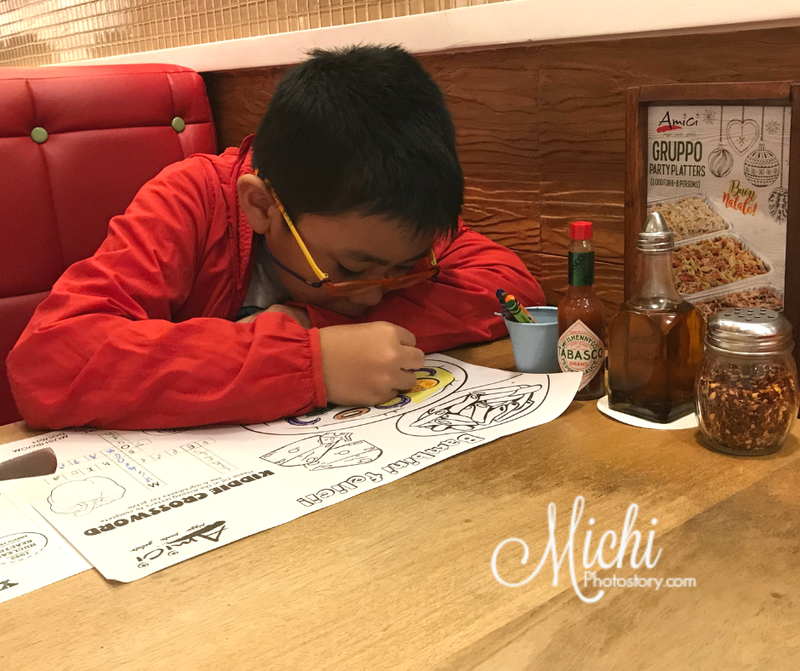 If ever we will eat here again, we will just order two meals since my son cannot finish his food naman so we can share. P.S. 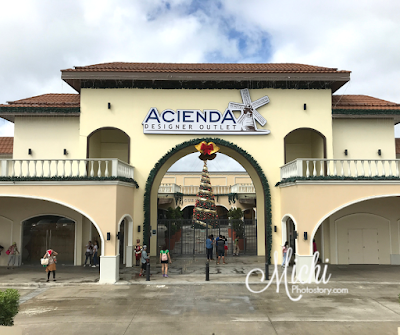 After breakfast, we dropped by at Acienda Designer Outlet but unfortunately, it was closed pa. We don't want to wait for two hours for the 12NN opening so we just went home na lang. As months go by, Althea keeps on increasing their product line so aside from skincare products they are now offering a body mist. Althea collaborated with Kurniaty Kamalia or Titi Kamal, a popular actress and singer in Jakarta, Indonesia. A fashion and beauty icon that is best identified by her long, straight and black hair. Stay Fresh Body Sparkling Mist is the collaboration fragrance of Althea and Titi Kamal. It is a lightweight body fragrance that has a fruity and floral scent. A concoction of orange, peach, and rose which is Titi Kamal’s favorite scents. I remember when I was still in college years, this is one of the trends. Uso yung floral and fruity scent and I used to buy body mist too. From time to time I also received body mist if I have relatives coming from abroad. But when I started working, my preference changed so I stopped buying body mist. A few weeks ago, I received Althea Stay Fresh Body Sparkling Mist, at first I was hesitant to try it because I’m not really into floral scent. Feeling ko baka masakit sa ilong, baka mag-amoy air freshener ako or baka mas bagay sa grandmother ang scent. But I was wrong, I like the combination of the rose, peach and orange. Elderflower extract - cools and soothes the skin while giving out a feminine scent. After taking a bath or washing the body, spray the product lightly on the body. Spray on your pulse points like throat, wrist, between breast, inside the elbows, and behind the knees. If possible, use unscented lotion so you can appreciate the scent of the body mist. P.S. Though I like the scent, my husband doesn't like it. Sabi niya amoy matanda daw at masakit sa ilong. So it really depends on your preference. I just told my husband na nakikiamoy lang siya so bawal magreklamo. hehehe! If you know someone who likes the floral and fruity scent, this is a nice gift. I will purchase this when they have a 1+1 promo again. I find it expensive for P450 because it is only 100ml. If this is your first time ordering at Althea Korea, use this link to get a discount. Minimum of P1500 for your first purchase. We all know that cleansing our face is very important and it should be part of our skincare regimen every single day. Sometimes using soap is not enough to remove all the dirt, make-up and other impurities on our face. So if you want to have a healthy, clear and radiant skin make sure to invest in a good cleanser. Koreans are known for “Double-Cleansing” method because they believe that oil and water don’t really mix so you have to use an oil-based cleanser and water-based cleanser. Proper cleansing is important because it prevents product buildup or congestion, it reduces the size of your pores, it maintains the pH level of the skin and it ensures that your skin absorbs the skincare products that you are using. Good news to everyone, Althea has a new product and it is good for all skin types so if you are looking for a good cleanser, you can try Althea Pore Purifying Serum Cleanser. It is a cleanser with a serum-like formula so it is a combination of water and oil in overlapping layers. It helps you remove makeup, dirt, and oil without drying out the skin and it balances the pH level of the skin. As part of Althea Angels, I received this product few weeks ago and tried it. 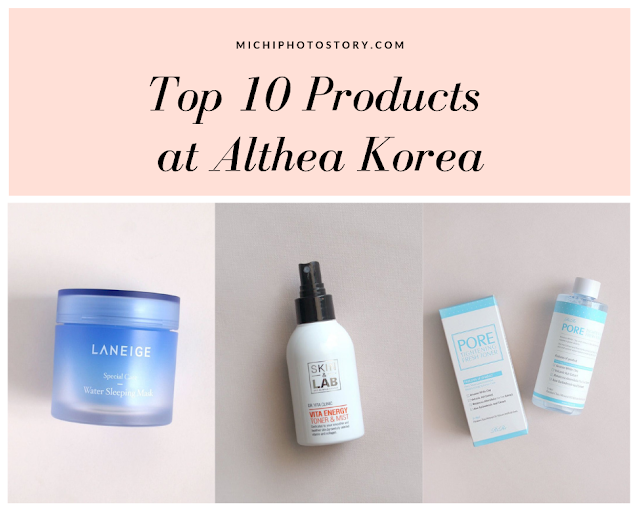 I like the Althea Pore Purifying Serum Cleanser because the texture is not thick like oil so it is not sticky and it doesn’t leave oil residue on my face. 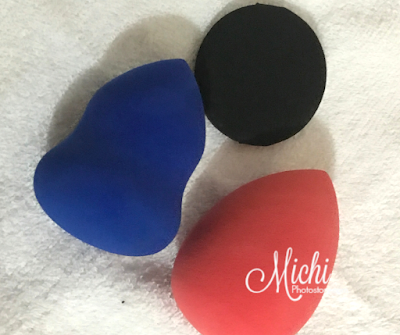 It really cleans the face, the make-up really melts away and because of that I even use this to clean my face cushion. 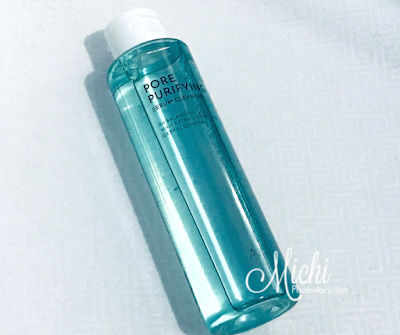 If you always put make-up on your face, this is a good cleanser for you, no need to buy make-up remover because this one can remove makeup and cleanse your face. It is perfect for your evening routine. Althea Pore Purifying Serum Cleanser is available at Althea Korea site for P430 (P150). Cleanser + Serum in one product. Car crashes can happen to anyone at any time as they occur at least every minute globally. By following all the required traffic rules, you can almost effectively avoid causing accidents. However, that cannot protect you from being the victim. Its impact can be simple while some crashes may cause damage, injuries, or death. In either scenario, it is good to know how to get help in a car crash. Being in a car crash is dangerous as you are at high risk of being injured. Checking yourself and the passengers for any injuries is important. When a crash occurs, the human body can go into shock and can affect the ability to feel pain for hours or even days. Therefore, look for any bruises, dizziness, or vomiting as they indicate symptoms of a concussion. If you find any injuries that need treatment, you need to contact your insurance provider to avoid being denied cover. 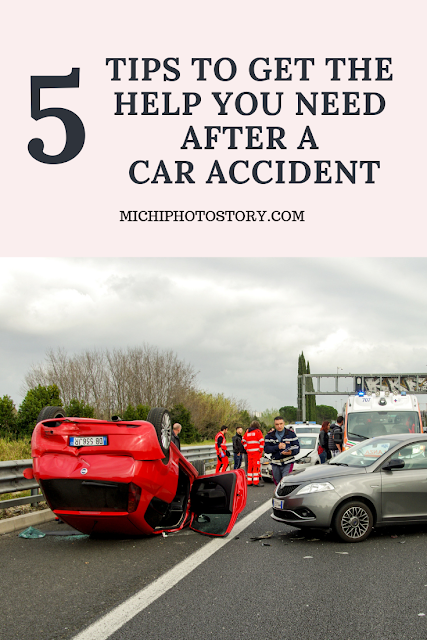 In case anyone has been hurt due to a fellow motorist’s carelessness, it's best to call your lawyer to ensure that you get the deserved compensation. If you do not have a Lawyer, I would recommend that you reach out to Bell & Pollock accident and injury attorneys. They offer consultation and help you be compensated for the injuries and damage incurred during an accident. If anyone is injured, it is crucial to contact an emergency response service or ask the people around you to call for help in case you are incapacitated. Let them know your exact location, the number of casualties and the type of injuries so that they can effectively brief the paramedics. Also, include information about any hazards such as leaking fuel or loose electrical wires for fire response needs. Notifying the police is important so that they can cordon off the location and investigate the causes of the crash. Do not move from the scene until police and the emergency team arrived. Just turn off the engine and switch the hazard lights on to warn other road users of the accident. Moving the injured person should only be done by the paramedics. If you move them, it might worsen their condition and complicate their recovery. Not moving the vehicle is helpful to the police during an investigation to unravel the cause. Only when your car is causing a hazard should you move it to the roadside. When the police arrive, they will ask you to report what happened. Let them know the facts of the crash and not your personal opinion. Avoid taking the blame as it may invalidate getting insurance cover or liability in legal suits. Let the police do the investigation and collect evidence to find the fault. If you are in shock, you should contact your lawyer before contributing to a report to avoid presenting a statement that can incriminate you. After the crash, the other driver's insurance provider may contact and try to offer a low settlement. Do not agree to their terms just because the crash did not cause much damage without notifying your insurance provider. This is because some injuries or mechanical damage appear long after the accident. Before signing any settlement documents, consult your lawyer to guide you. 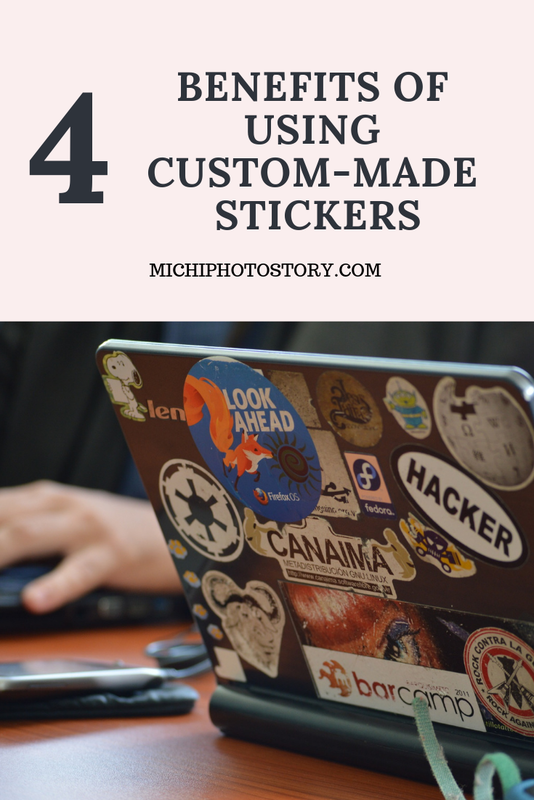 Most people and organizations have not yet fully understood the importance of using custom made stickers in their marketing plan. They focus more on billboards and banners forgetting that small sized stickers can do so much for them in terms of reaching their target audience. People always associate a brand with a certain type of sticker and if you have a custom made sticker design for your company, your brand will be able to stand out from the rest. The benefit of using a custom sticker is that you can differentiate your brand from the rest. 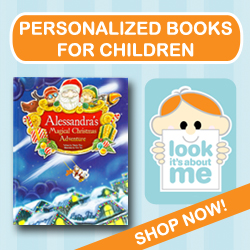 You can have your sticker in a unique design with unique color combinations and in different shapes and sizes. This will make a unique impression on your target audience and every time they see your sticker, they automatically recognize your brand. 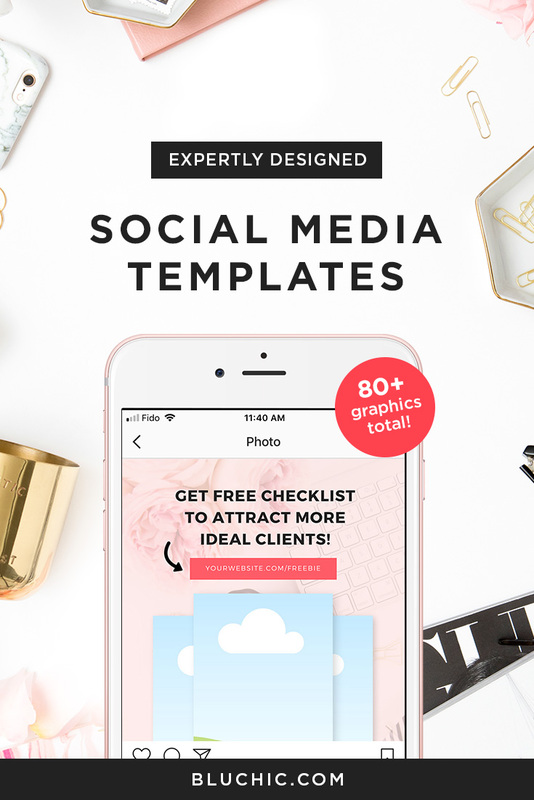 The main reason for you having a sticker is to pass a message across to your target niche. You want them to know something that will benefit them, offer a product or service that will meet their need, your aim being to get them to come to you. With a custom made sticker, you can relay your message in your own personal way that you feel will effectively communicate to your target customers. Having studied your audience, you know what appeals most to them. 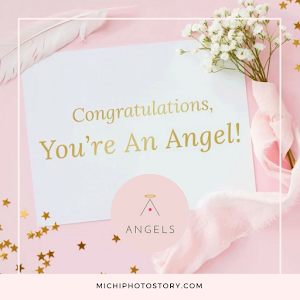 As such, you can have the stickers designed with your message in that format that will connect well to your audience. Other marketing methods that brands and companies use are limited to specific platforms. There is a lack of flexibility to incorporate them on other more personal platforms which you deem to be more effective in connecting with your desired market. For custom made stickers, however, you can have them designed in such a way that they can be fitted on mugs, pens, phone cases, book covers, laptops, bags, key holders, the list goes on and on. Don’t limit yourself. 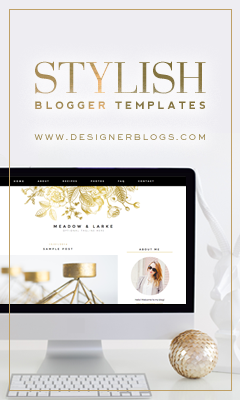 Have some custom made stickers which can fit on more platforms and widen your marketing scope. Compared to calendars, hats, t-shirts and other types of marketing strategies commonly used, stickers have a longer lifespan. The material used to make them is quite durable and they can withstand different environments and conditions. Whether you stick them on your car and the sun is hot or the rains fall heavy, they still withstand the harsh conditions. Whether you have them on mugs and you wash them regularly, they still hold on well. They have a good lifespan and this cuts down the cost of remaking them over and over again. Custom made stickers are much more advantageous to have and will serve the purpose of marketing your brand well. Their cost of production is low and their power of advertising is high. They are definitely a plus to have for your brand marketing. You can get Sticker Printing from Stickeroo. Check them out today. 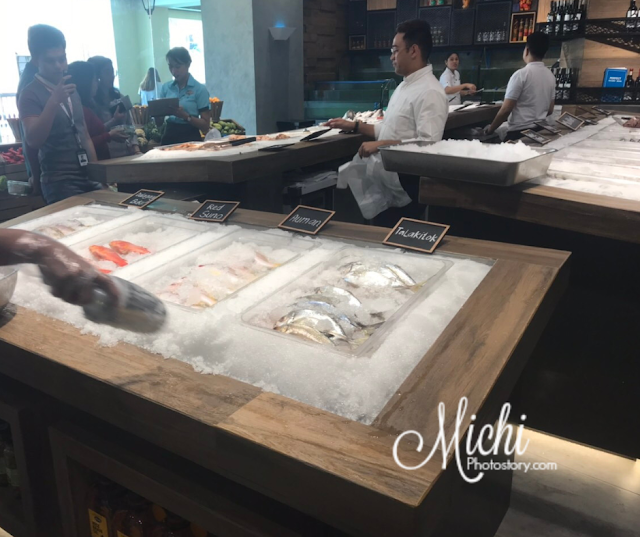 Early this year, I’ve blogged about Isla Sugbu Seafood City Paluto All You Can. 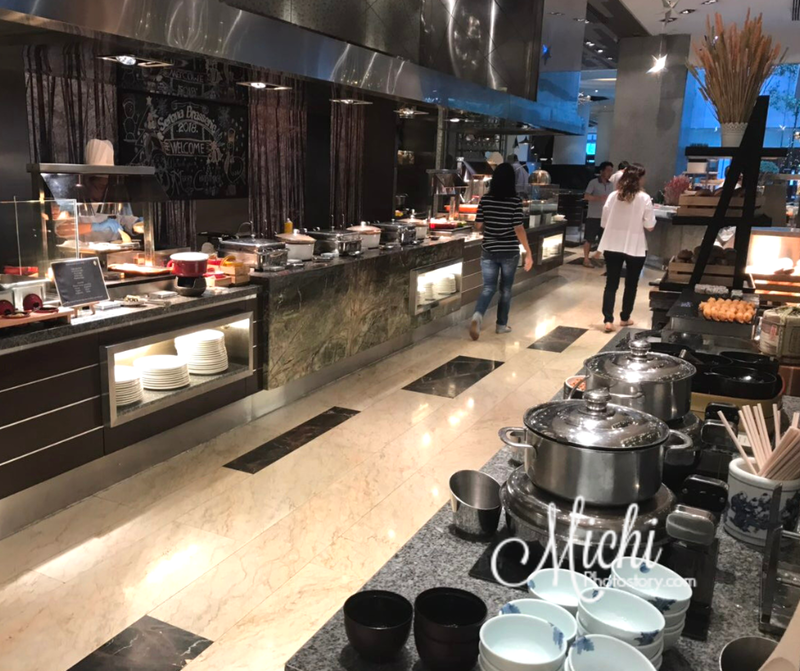 It is a buffet restaurant in Cebu, my husband loves this restaurant so he always eat here whenever he is in the city. This is also the reason why I want to go back to Cebu so I can try this level-up Sutukil of the Cebuano. You can check my review here. Last month, my friend messaged me and asking me about “Isla Sugbu”, her officemate stumbled upon my post and they are planning to eat here. I’ve learned from her na magkakaroon na pala Isla Sugbu Seafood City sa Venice Piazza and I was so happy. 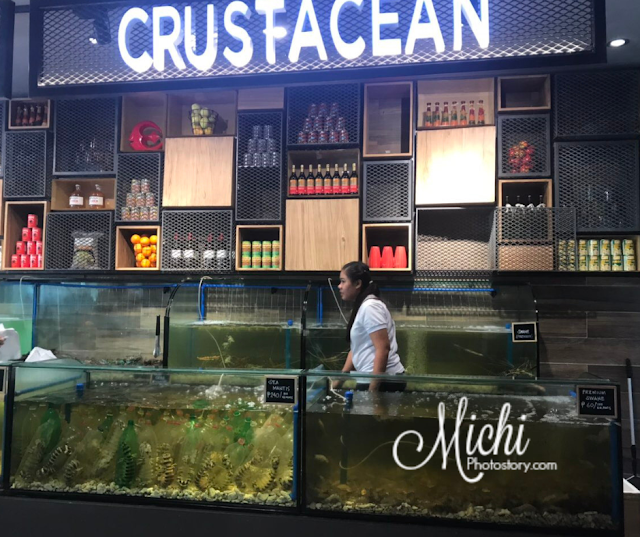 Hindi ko na pala kelangan lumipad ng Cebu para ma-try itong Seafood City. 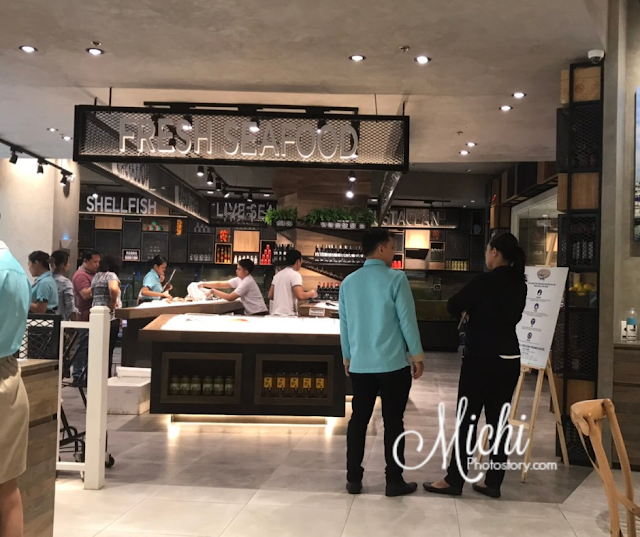 Honestly, this type of restaurant is no longer new to us because we already have “dampa” restaurants where you can buy seafood or meat at the market and bring it to the restaurant staffs so they can cook it according to your preference. Of course, you have to pay and the fee depends sa dami or luto na gusto mo. 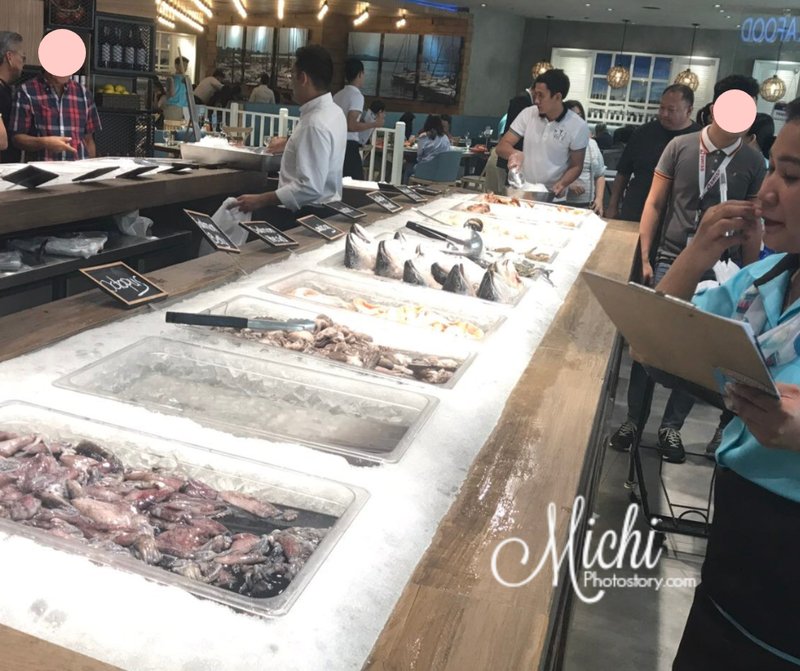 But what I love Isla Sugbu Seafood City concept, is you can eat as much as want for a fixed price. Wala ng wet market because you can choose your seafood inside the restaurant. 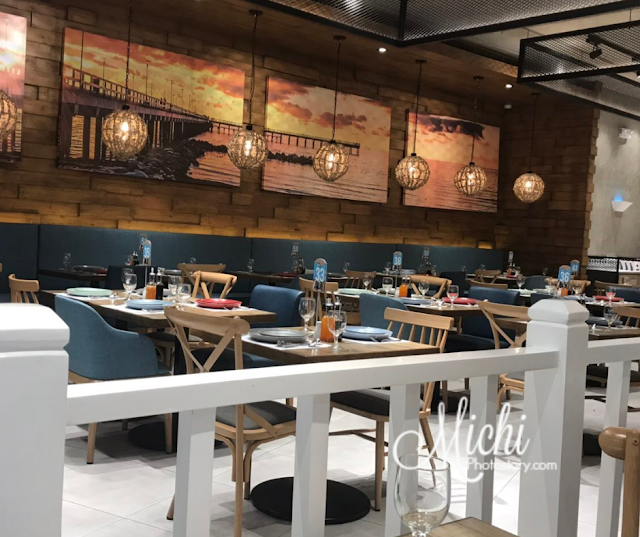 Indeed, you will enjoy their Paluto-All-You-Can talaga. I told my husband about this, kaso inunahan na naman niya kami so hindi ko pa siya natry. 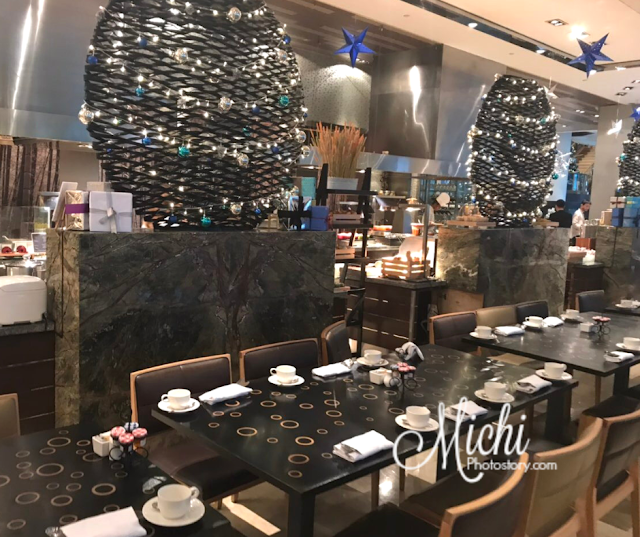 They had Christmas lunch here last week and according to him, the set-up is the same sa Cebu. The only difference is fewer selections and mas mahal yung rate. 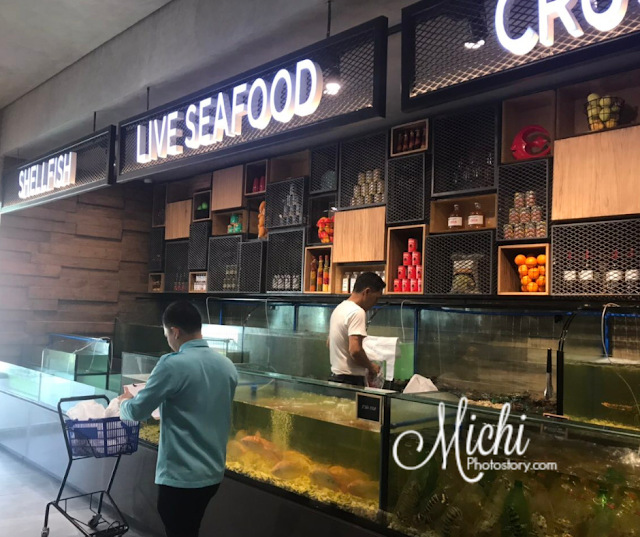 There are fresh and live seafood, vegetables, and for the meat lover, don’t worry they have chicken and pork too. 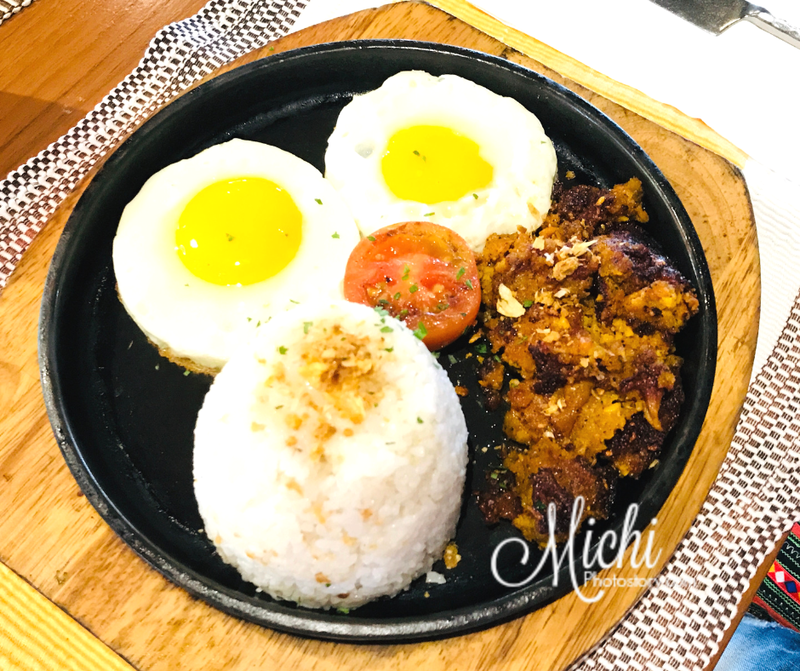 My husband was busy eating so I only have limited photos but you can check my other post, to give you an idea kung ano pwede niyo paluto since there is no fixed menu but there are staffs that will assist you. 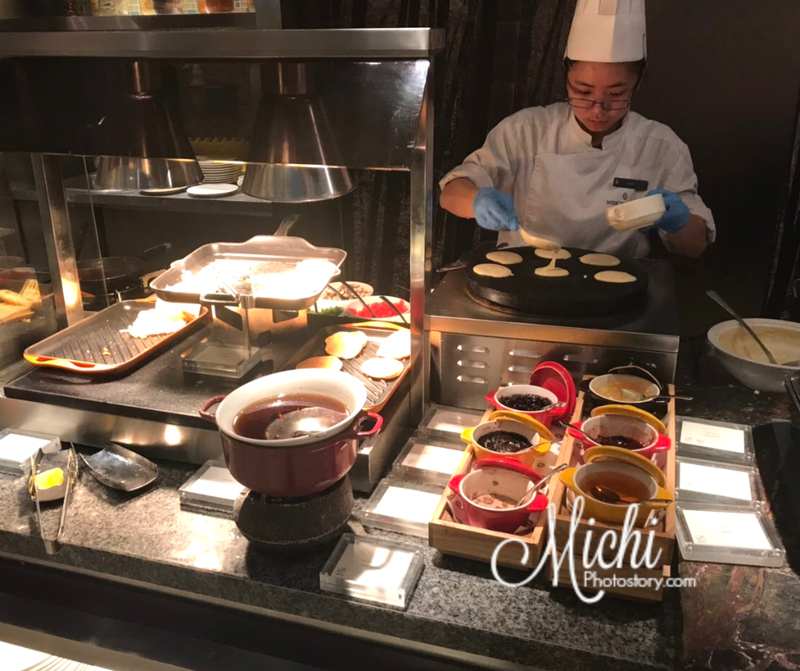 Take note, not all foods are free or included in the buffet rate. Meron dun na may bayad din pero for sure mabubusog ka na dun sa mga free. * All drinks, desserts and other items labeled as PREMIUM are charged separately. What are you cravings for today? 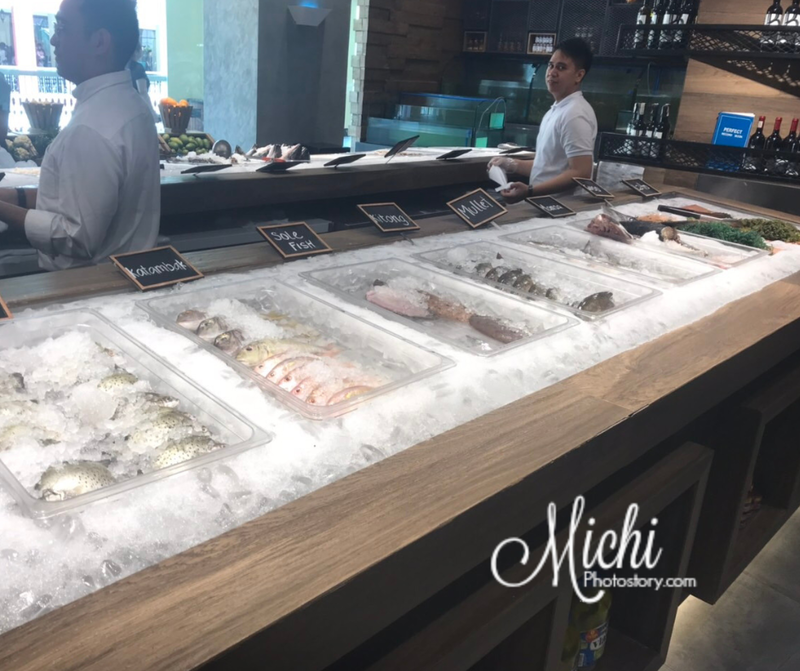 Take your pick from our wide array of fresh & Live Seafood. After getting your fresh catch, let us know how you want your seafood cooked. Or if you’re feeling adventurous, you can take our recommendation. Time to dig into your delicious seafood feast! If you need anything else, we’re just a call away. Once is never enough. So go ahead and dive in again. 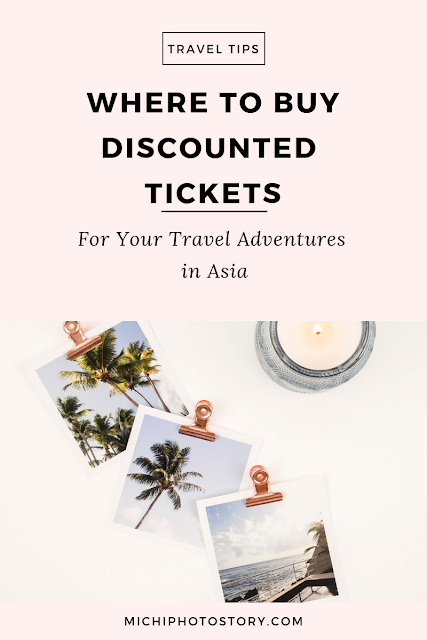 * Prices are inclusive of VAT and are subject to service charge. I hope makainan ko siya habang promo rate pa. I had my lab test and a doctor’s appointment last week. After check-up, instead of going home, I told my husband to go straight to Alabang Town Center so I can look for Christmas Gifts. We had lunch first at Amici. It’s been years since the last time we ate here, sa dami ba naman kasi na restaurant sa Alabang Town Center ang dami ko gusto kainan. Most of the time, we will just buy gelato here. 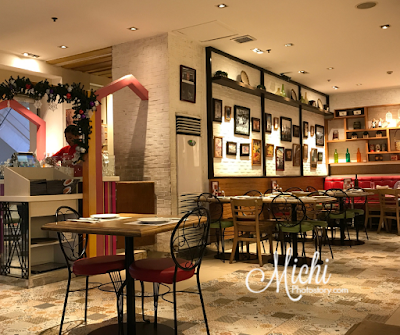 I remembered our first dining experience in Amici Don Bosco Branch, 7 six years ago self-service pa siya but now, you don’t need to go to the cashier to order and pay your bill. 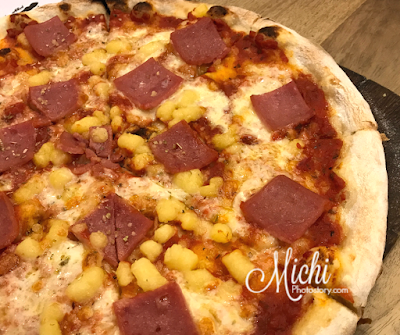 Our old favorites here are Tutta Carne Pizza, Spaghetti alla Carbonara, Pollo Arrostito, Sansrival, and Gelato. 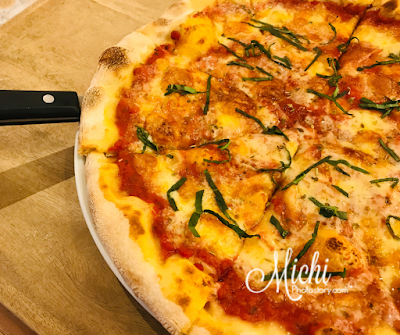 Amici serves pasta, pizza, and gelato. While browsing their menu, I noticed na ang dami na nila food choices, may option sa pasta if you want regular or grande size and may rice meals na rin. 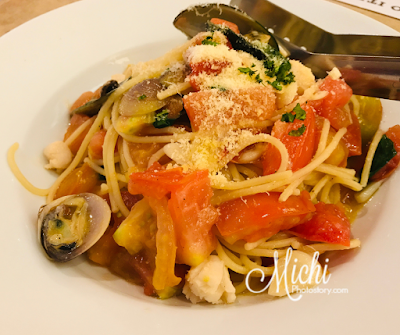 My husband and I ordered Spaghetti ai Tesori del Mare P420 (Regular), Margherita Pizza P345 and Oreo & Blueberry Cheesecake Madness P210. 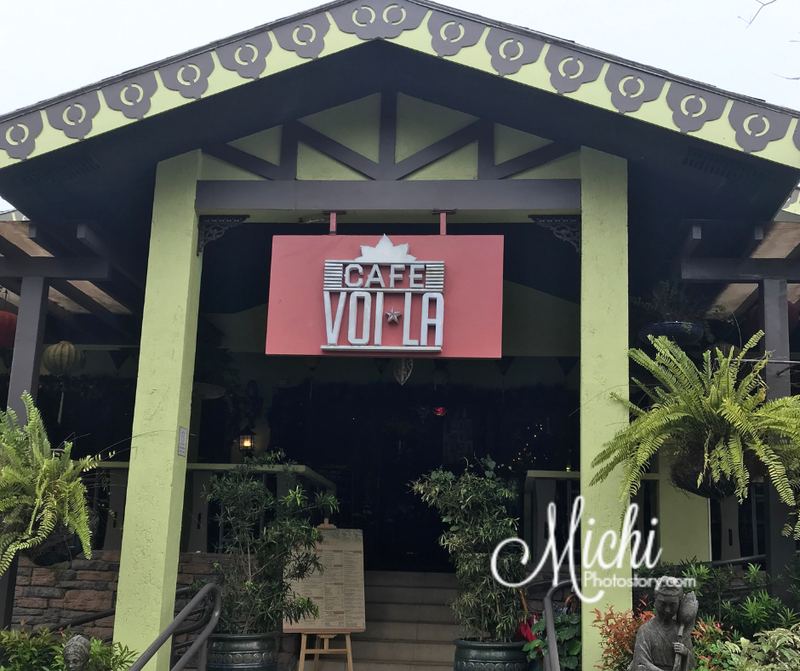 The staff offered Gusto Privelege Card where you can get a discount for every visit but we declined since we seldom visit ATC or dine at Amici. While waiting, they served complimentary hot bread and it is good. Sana pwede refill, hehehe! After finishing our bread, they served our pasta, ang bilis ng service nila. Spaghetti ai Tesori del Mare is a mildly spicy feast of spaghetti, tomatoes, scallops, clams and chili oil. I’m not fond of spicy food but I liked this pasta because the spiciness is really mild. I ordered Margherita pizza and while eating, my husband said bakit wala ko malasahan na toppings. I just laughed and I told him, Margherita lang order ko so cheese and basil lang yun. Hehehe! Nasanay siya na Tutta Carne order ko. For dessert, I initially ordered Ferrero-Chocolate Overload but it is not available so I ordered Oreo & Blueberry Cheesecake Madness. 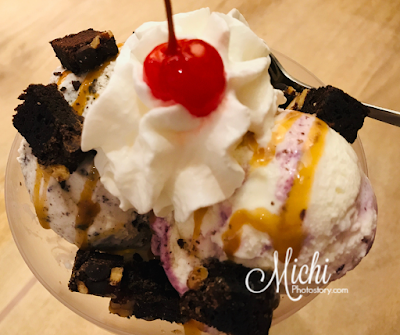 Combination of an oreo cookie and blueberry cheesecake gelato topped with caramel syrup, brownie chunks, whipped cream, and cherry. 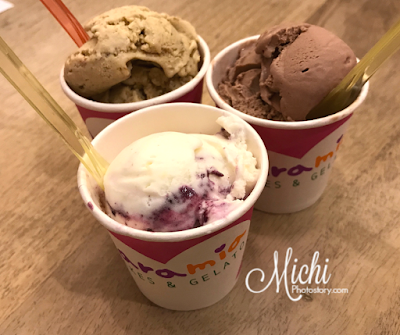 We liked this gelato and it is good for sharing. 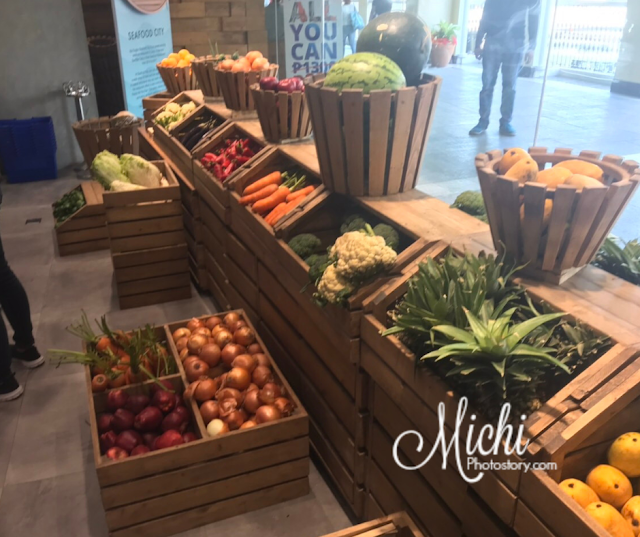 We fetched our son in school and off we went to Alabang Town Center to buy his gift, we were so busy with so many things and we forgot to buy stuff for ourselves. 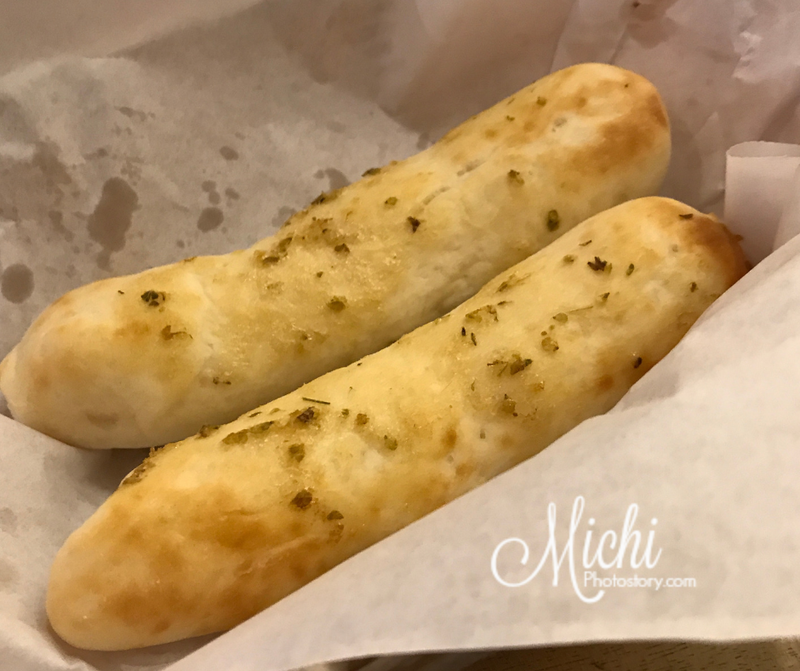 We just ate at Amici last week but we decided to eat here again, this time with my son. 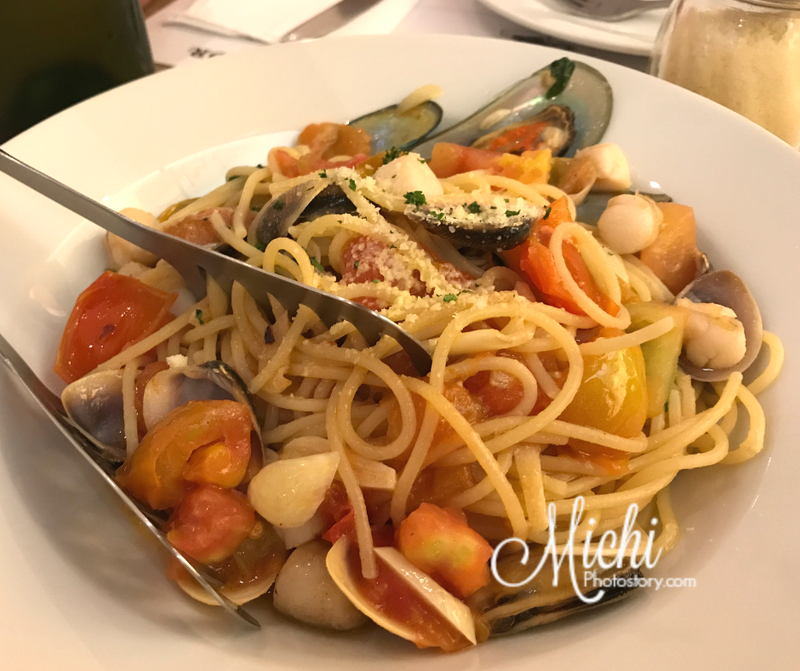 We ordered the same pasta which is Spaghetti ai Tesori del Mare P420 (Regular) because we liked it. My son ordered Ham and Two Cheese Pizza P368. 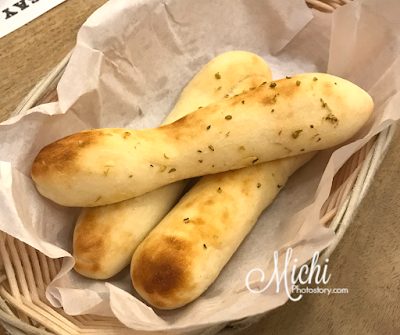 While waiting, they gave us complimentary bread, one stick of bread per person. The staff gave a Kiddie Sheet and crayons to my son. 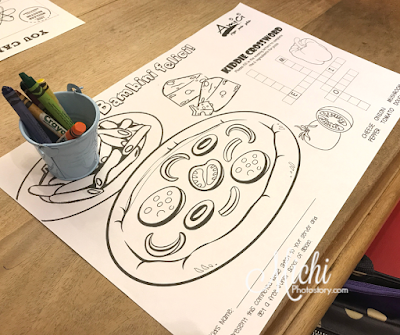 My son read the note “Present this completed Kiddie Sheet to your server and get a Free Junior Scoop of Gelato” so he immediately colored and answered the page. My son likes pepperoni pizza but it is not available so he chose Ham and Two Cheese Pizza, it has ham, mozzarella, and cheddar cheese. Mukhang corn or pineapple yung cheddar cheese. We only ordered pasta and pizza but still, we did not finish our food. May take-out pa rin kami na pizza to think na tatlo na kami kumain. But of course, we won’t leave without eating gelato. We showed the Kiddie Sheet and asked the staff kung totoo ba na may free gelato yung anak ko and she said yes. So my husband and I ordered Junior Gelato Cup too P60 each. The staff informed us na maliit lang yung cup but we still ordered the junior size because the last time that we ordered Oreo & Blueberry Cheesecake Madness gelato, nahirapan kami ubusin yung order namin. My son chose Ferrero, my husband chose Pistachio and I ordered Blueberry Cheesecake again. While waiting for our gelato, the staff served a slice of cake on our table. 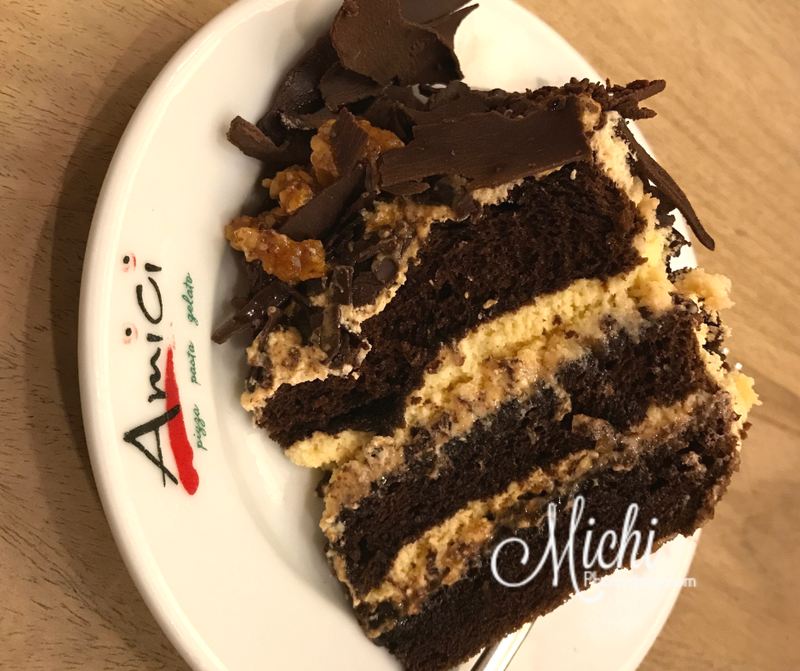 Sasabihin ko na sana na hindi kami nag-order ng cake but the staff already said na FREE daw yun. Wow, may free gelato and free cake kami that day. The Midnight Dream Cake is layered decadent chocolate chiffon with caramelized cashews, chocolate, and cream. When they served the gelato, ang liit ang talaga but it is enough to satisfy our gelato cravings. Again, we were satisfied with the food and service. Mukhang mapapadalas na kami sa Amici at may mga freebies. hehehe! It’s been more than a year already since I started my Korean skincare journey. I’ve been buying and trying different products since last year and so far, I am happy with my purchase. But of course, I won’t deny that I have my own favorites too so if you are looking for a gift for yourself, why not buy a skincare product. Let me share my top 10 favorite products that I bought at Althea Korea site. Last year, I bought Althea Korea Head to Toe Box and this package includes Skin & Lab White Vita-C Essence and among the products in the box, this is my favorite. This essence will brighten your skin tone, moisturizes and whitens the skin. Get this if you have a dark skin tone, dull skin, uneven skin tone or if you want a good essence for your skin. They no longer offer the Althea Korea Head to Toe Box but you can buy this for P730 at Althea Korea. I’m already on my third bottle of this. Unfortunately, sometimes it is out of stock so it is better to hoard before you run out of stock. Or you can also check the Skin & Lab Red Serum and Skin & Lab Dr. Vita Clinic K Plus Red-X Essence. This sleeping mask is expensive for my budget but I splurged on this one and it is part of my birthday haul. I like this sleeping mask because it helps you relax before sleeping and it soothes, hydrates, moisturizes and brightens your skin. It helps your skin to recover and repair overnight. This mask is lightweight, non-sticky and good for all skin types. 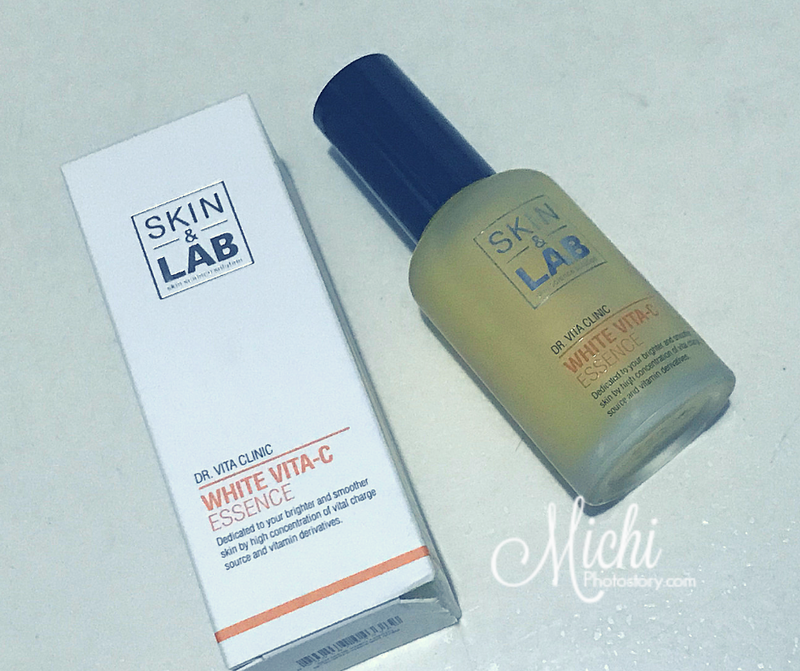 I was satisfied with my Skin & Lab Vita-C Essence so I decided to check the other Skin & Lab products and I purchased the Skin & Lab Dr. Vita Clinic Vita Energy Toner & Mist. What I like about this product is you are hitting two birds in one stone, you can use it as a toner and mist. It is so easy to use and it makes your skin looks healthy and bright. It is good for all skin types. While I was browsing Althea Korea site, I saw Rire Pore Tightening Fresh, this 300ml toner is only P360, it is cheaper compared to the Skin & Lab so I bought it. So far, I am satisfied with this toner and I already bought two bottles of this. This toner deep cleanse your pores, minimizes enlarged pores, control excess sebum and doesn’t dry your skin. I started using Althea Real Fresh Skin Detoxer last July, it is part of my Welcome Kit at Althea Angels. I am really lazy in doing my skincare routine so I was happy to try this 10 seconds wash-off mask. I used this as my cleanser every night. This product cleanses, soothes and protects your sensitive skin. It smooths and adds glow to your skin. It is available in two variant, Rose and Green Tea. Onsaemeein Yogurt Peeling is part of my shopping loot during my first order at Althea Korea. It was on sale that time so I added it on my cart. I got it for P210 only. This is one of my favorite because it gently removes my dead skin cells and scent is very light. No redness after using it. 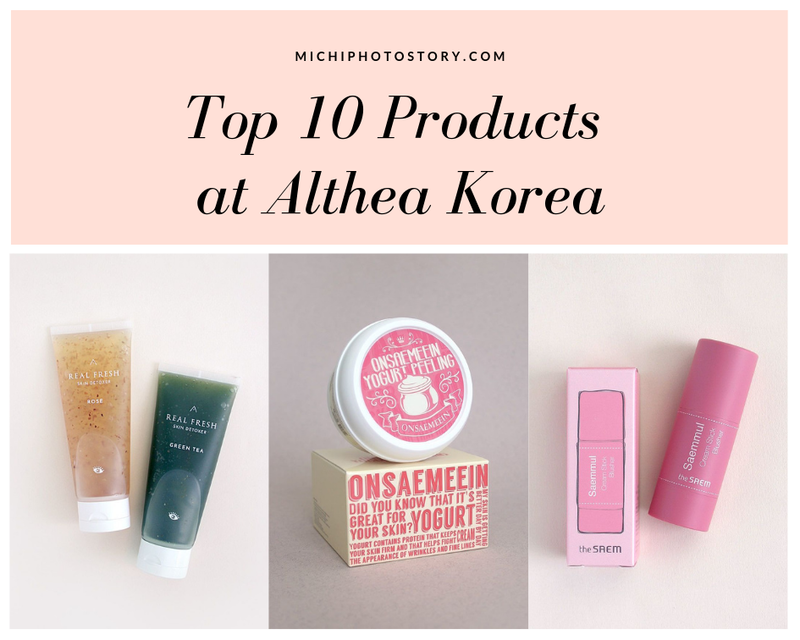 The Saem Saemmul Cream Stick Blusher was part of my Althea Korea Lazy Sunday Box. It was my first time using a cream blusher and I loved it. And because I am satisfied with the product, I also bought another color of this cream stick blusher. I like this because it is a lip and cheek tint and it doesn’t stain my finger after applying this. I have Coral and Rose Fire color. This is part of my birthday haul too but I just started using it last month. Like Laneige Brand, Innisfree is on the expensive side. 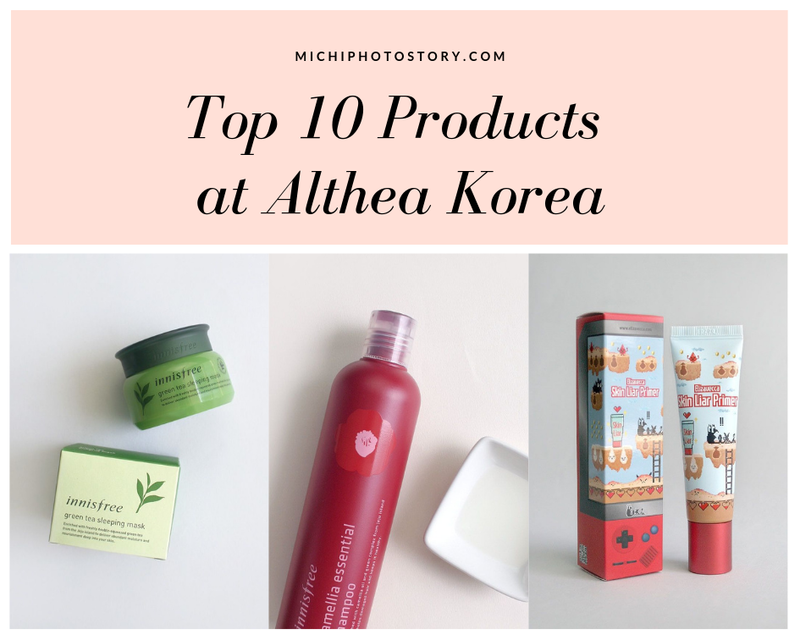 I’ve tried a lot of cream at Althea Korea and so far this is my favorite cream because it is lightweight and not sticky cream. I like the smell of the green tea too. It makes my skin hydrated and soft. This is the second shampoo that I tried in Althea Korea. I find it expensive for a shampoo but I still bought it. After few weeks of using it, my husband noticed my hair and he asked me what shampoo I’m using. And because of that, may kashare na ko sa shampoo ko. Hehehe! Innisfree Camellia Essential Shampoo makes my hair looks healthy and shiny. I don’t even use conditioner but this shampoo already moisturizes and conditions my hair. It is silicon-free too. I even bought Innisfree Green Tea Mint Fresh Shampoo few months ago but I haven’t tried it yet. Whenever I watched YouTube videos, I always hear primer so when I saw Elizavecca Skin Liar Primer, I immediately added it on my cart. I like this primer because it smooths your skin texture, fills in pores and it has flawless matte-finish. I love the scent and the price is budget friendly too. If you haven’t tried shopping at Althea Korea, use this link to get a discount for your first purchase. Minimum of P1500. Kuala Lumpur is the capital of Malaysia and it is known for Petronas Twin Towers so if you are going to visit this city, I’m pretty sure that you won’t leave the place without visiting this skyscraper. 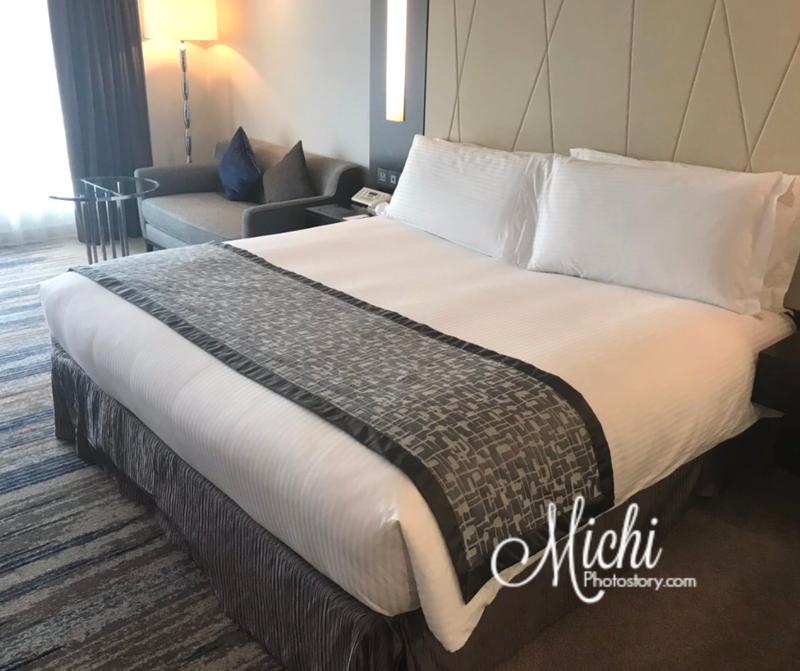 When we first visited Kuala Lumpur, we stayed at Bukit Bintang area so we were able to visit the Twin Tower during day and night though it is a long walk from our hotel. But there are a lot of hotels where you can stay which is just a few minutes away from Petronas Twin Towers like InterContinental Hotel. It is located in the strategic location of Jalan Ampang, it is five minutes away from Suria KLCC and Petronas Twin Towers, two minutes away from Ampang LRT station and few minutes walk from shopping centers in Bukit Bintang area. The hotel offers complimentary shuttle services around the entertainment hubs. 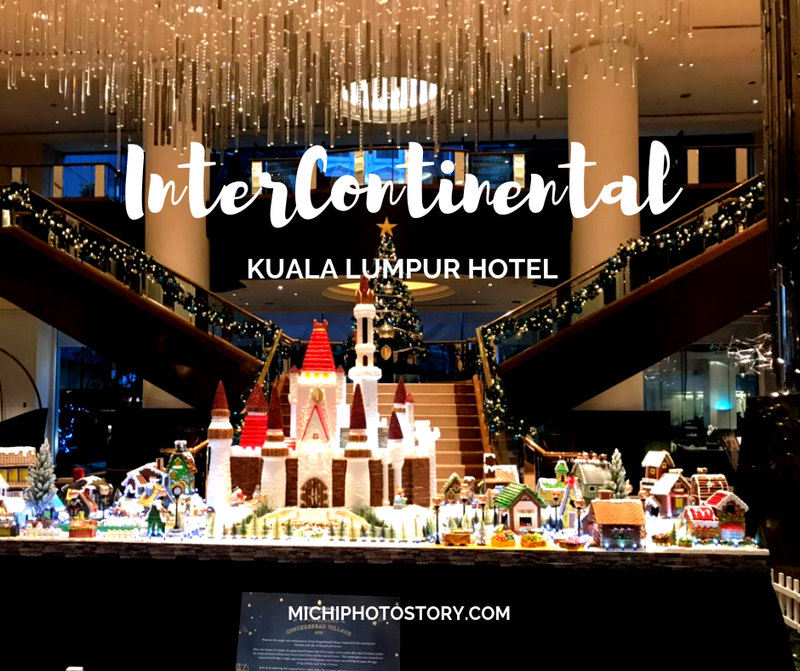 My husband stayed at InterContinental Kuala Lumpur hotel last week during his business trip. They had a one-day event at the said hotel. 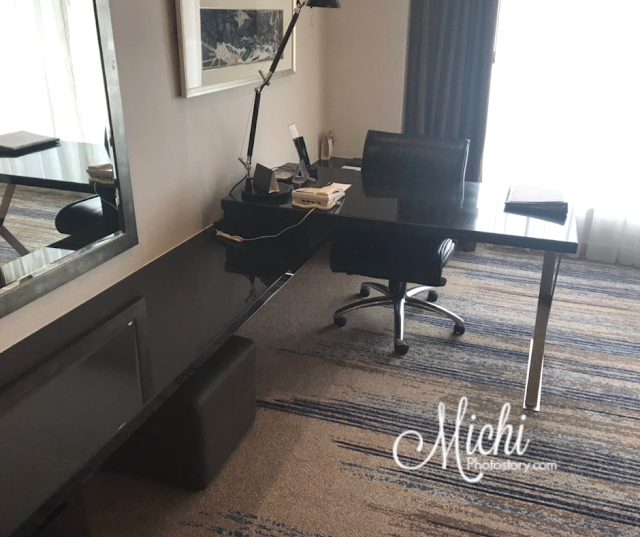 It was his first time in InterContinental hotel and according to him, you can see that the hotel is already old but clean. He likes the good service and there were so many Filipino staffs there. The room is a little bit bigger compared to other hotels that he tried in Kuala Lumpur Malaysia. This is the room. They have coffee and tea set but it was the first time that I saw a Milk Menu. They offer a complimentary selection of milk for their guest, you can choose full milk, low-fat milk or soy milk. You can request via their Instant Service button, you can order hot or cold milk. 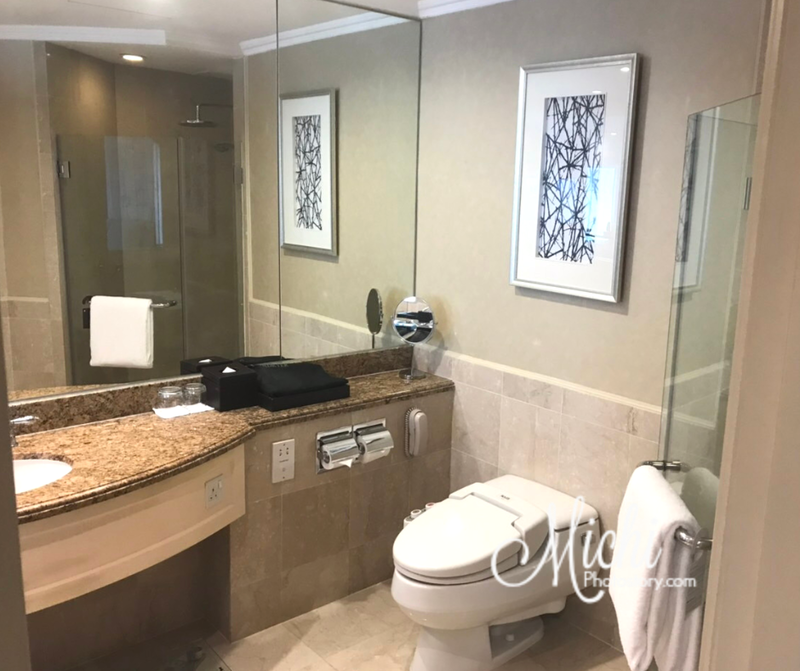 The bathroom has a separate shower and bathtub. 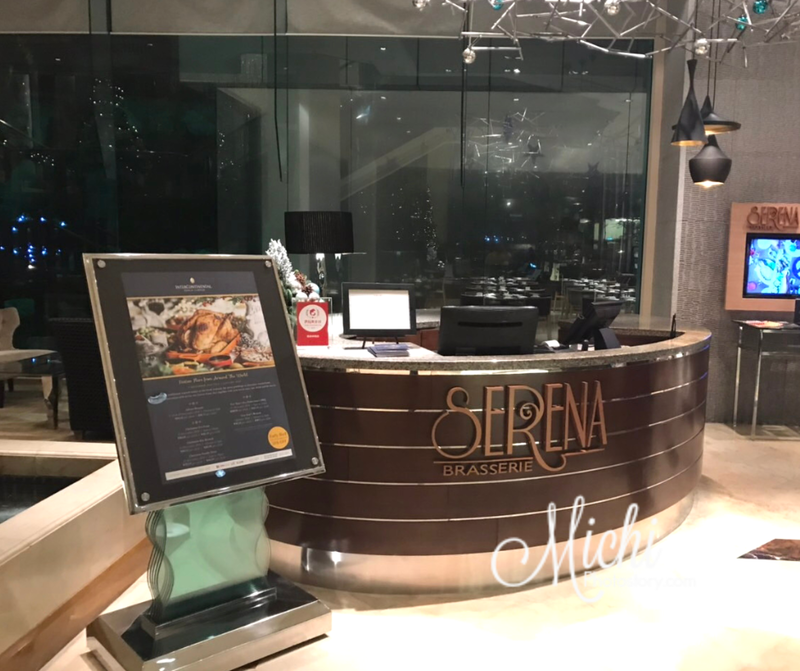 The room package includes buffet breakfast at Serena Brassiere. 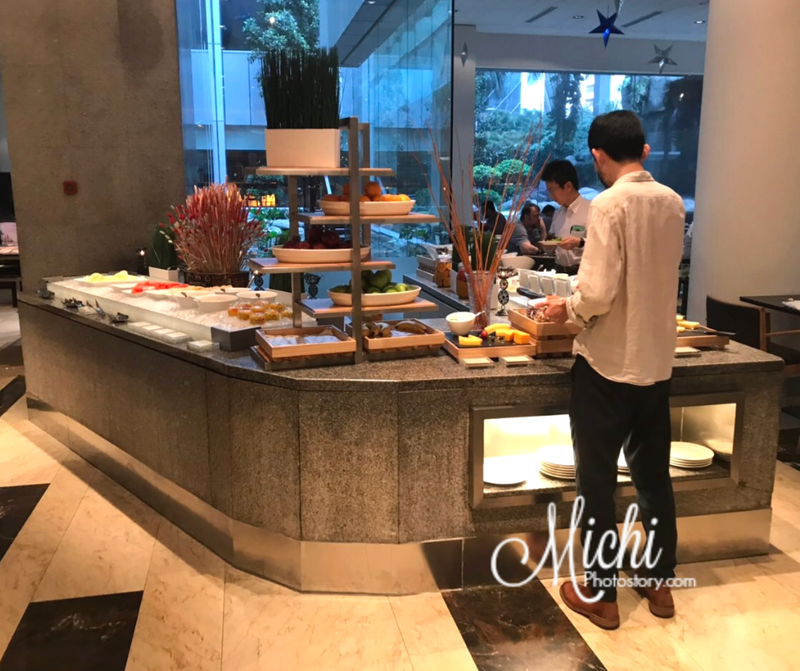 It provides appetizing breakfast for business and leisure travelers. 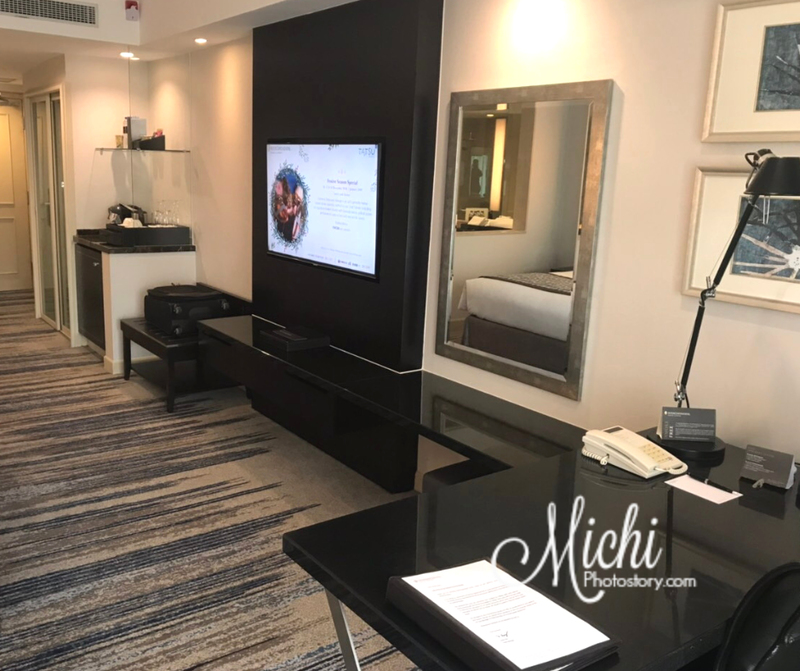 It is ideal for a family too because they have a children’s corner. 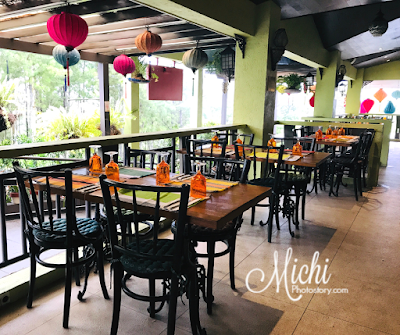 It serves mixed of local and international cuisines. 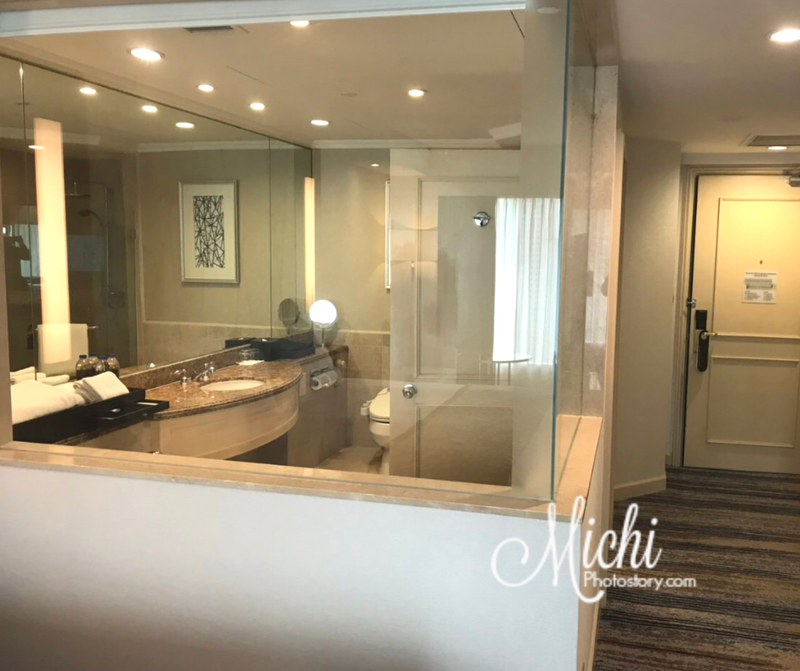 They have a spa, swimming pool, and fitness center for you to enjoy but because of limited time, my husband was not able to visit these facilities.